As soon as people see a drum, they picture themselves on a stage, with a band, sending the audience into a frenzy as they relentlessly beat their drumsticks to the rhythm. 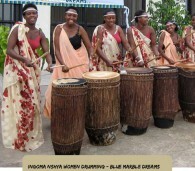 Luckily, with traditional Rwanda drums, the spectators aren’t as wild or the stage as intimidating. So, if you’d like to do some jamming and dancing, Red Rocks dance and drumming lessons could be just the thing. Drums are some of the most popular and attractive musical instruments in the world. And playing the drums is a form of expression that the locals hold very dear. In fact, it’s a known fact that Rwandese Intore drummers are there at every ceremony and festivity, beating their drums to the rhythm of the community’s heart. Come witness the beauty of drums that resound in unison, and be part of the lively group of people that makes their sound resonate through the community. Learn to play, jam and dance the day away with Red Rocks. The Intercultural centre offers this unique Rwandese cultural activity and many others, enabling you to enjoy local entertainment at its finest. Poetry, folklore, dance, music and the environment – they all come together in Rwanda. Come see for yourself!